Rashid Johnson, “Self Portrait in Homage to Barkley Hendricks,” 2005. Why is Self Portrait in Homage to Barkley Hendricks not included in the MCA’s current Rashid Johnson retrospective, Message to Our Folks? The photographic work is included in the exhibition catalogue, and MCA curator Julie Rodriguez Widholm writes that it is perhaps Johnson’s “most understood work.” The work is an illustrative example of both Johnson’s “dialogue with black American creative and intellectual figures whose impact has transcended race” and his “dialogue with modern and contemporary art history, specifically abstraction and appropriation.” Both these quotes are from the curatorial statement on the MCA’s website. True, other self portraits (some of which engage in appropriation and cultural and intellectual figures) are in the exhibition, but they don’t compare in my opinion to the stark and confrontational Self Portrait in Homage to Barkley Hendricks. Well what an unexpected night that was. Let me just say this event took me by surprise, this event was way more LA than Chicago. Let me spell it out for you: S-I-N-G-L-E-S N-I-G-H-T. This was the main reason I insisted my one friend come; she’s been looking for some action lately. No one goes to First Fridays for the art, and I completely see why. The DJ playing Daft Punk, the multiple buffets of food, several bars (if you’re lucky you get into the member’s bar), and the slew of sponsor tables make it hard to remember that there is any art here at all. This event seemed mildly inappropriate for a museum to host, and then I realized First Fridays is like a lot of museum events I’ve been to in LA. I realized I was totally fine with First Fridays, especially because I had a handful of free drink tickets. I wasn’t allowed inside Acconci’s clam, should I blame these people? There are also two big exhibitions currently going on at the MCA: Without You I’m Nothing: Art and Its Audience, an exhibition of audience engaged artworks drawn from the MCA’s permanent collection, and the Luc Tuymans retrospective. Without You, was hardly engaging, mostly because the security guards (following someone’s orders) were not allowing people to get busy with the artwork. The Tuymans show was muted (dare I say bland) in this chaotic nightclub atmosphere. It didn’t help that the art-types that came to this events had probably already seen the shows, and the non-art-types cared more about seeing (hotties) and being seen (by said hotties) than actually seeing art. I am not going to pretend that I am not guilty of this; I was more concerned with cashing in my drink tickets (and coordinating the rest of the night’s activities; “come meet us at the W!”). But I also tried to engage with the artworks behind the gallery guards’ backs, but had more trouble forcing myself to look at the halls upon halls of mauve Tuymans paintings. 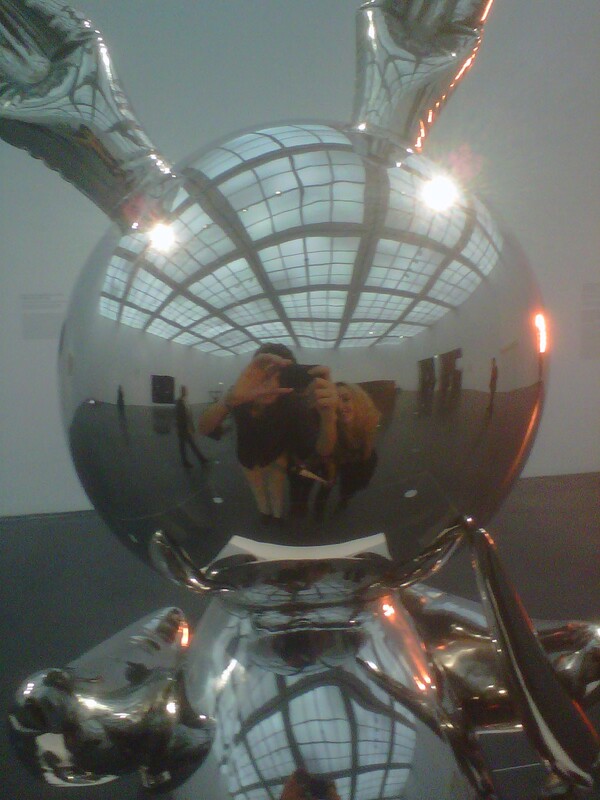 Some of the highlights of works I engaged with in Without You: Jeff Koons’s silver Rabbit. So because it reflects me, it needs me?—I’m going to disagree, and say this bunny doesn’t need me; it needs people like Eli Broad (the bunny is one of Broad’s favorites, although he doesn’t own this one; surprise they are multiples). 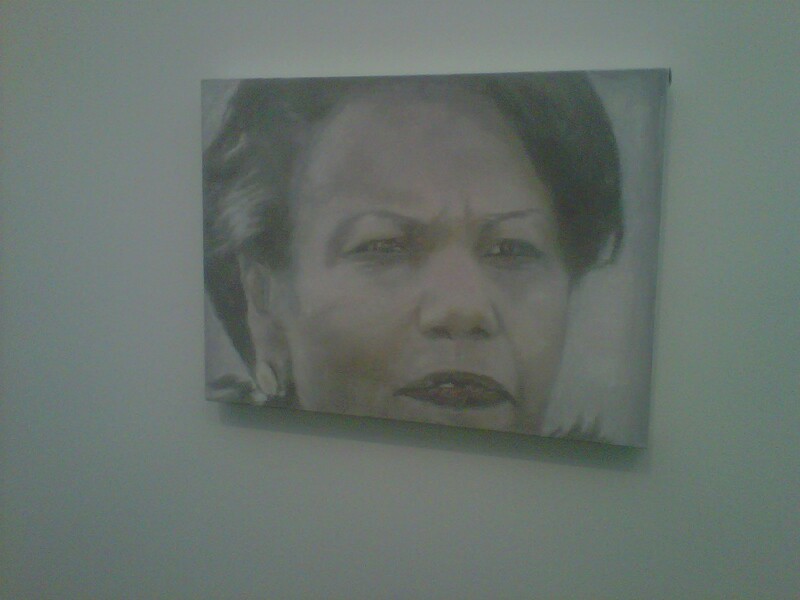 Tuymans’s Condi is not happy, but is she ever? Upstairs is the Tuymans show, which I flew through, hardly noticing the muted colors on the wall. 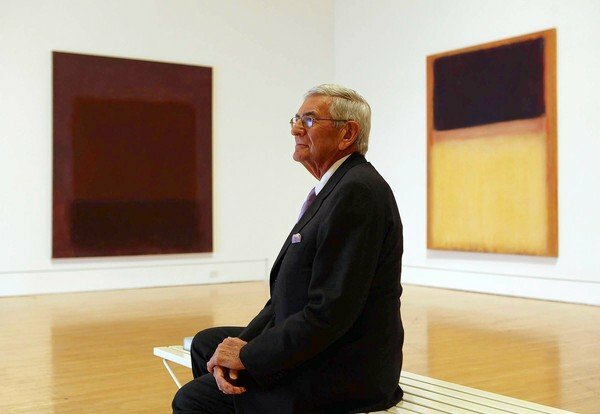 This is just a personal thing: I did personally enjoy some of his works (especially the large scale paintings at the end of this exhibition), but seeing room after room of paintings that look like the color has been drained or sucked from the neck gets monotonous. 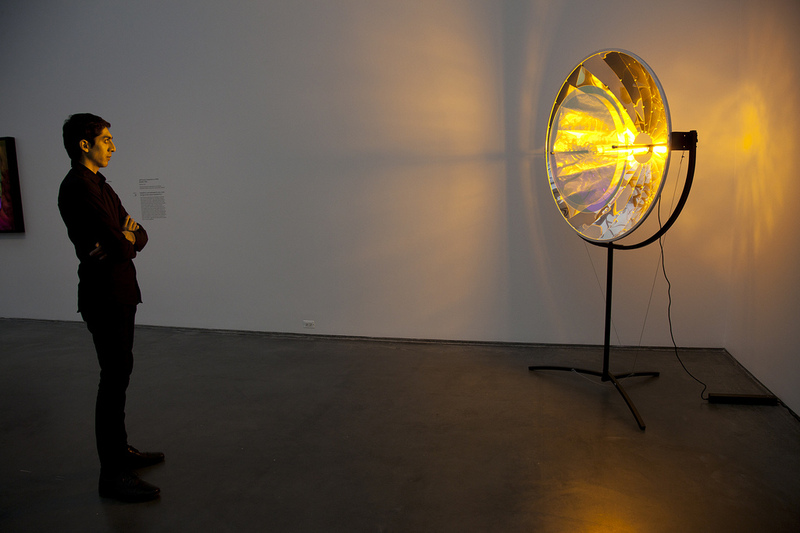 Some heat, courtesy of Olafur Eliasson’s heatlamp. How the sponsors fit into the “theme” is more questionable. Links of London had a huge table of products and posters featuring spokesmodel Kat Deely (remember her from So You Think You Can Dance?”). Also present were Crew hair products (not enough SWAG), Francesca’s Restaurants (which was serving something delicious and chocolatley), and it was unclear whether Tanqueray was also a sponsor (but I definitely enjoyed some thank you very much). 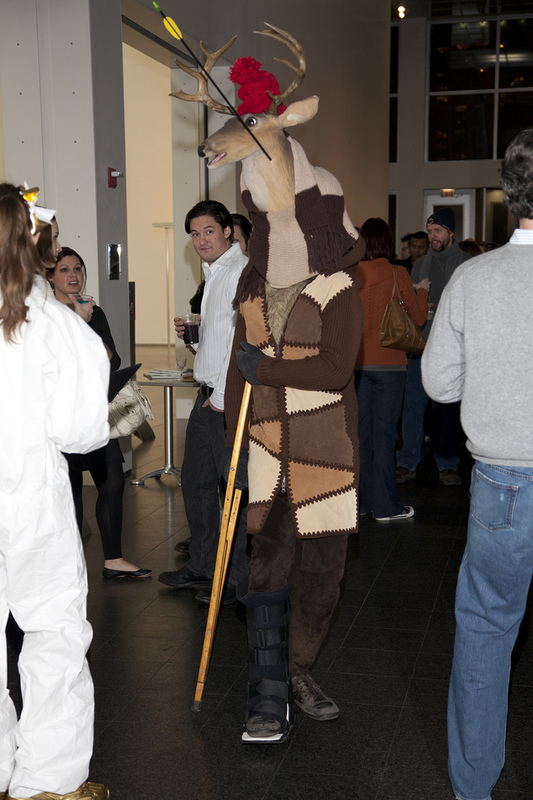 In general, this event was ludicrous (but not in a bad way). I would never go to this event to seriously look at the work and wouldn’t suggest you attempt to do so either, so thumbs down for the event. I will wager, however, that First Fridays draws in large crowds of people who otherwise don’t visit the museum, so thumbs up for the event. Another questionable element is this sponsorship thing, but hey if it means the MCA gets to put on these events at less of the cost, then who are you or I to question it. What’s your bottom line?—Mine is pretty low, but that’s because I come from the world of PR and corporate sponsorship. So shut up and enjoy your SWAG. The artwork begged me to dance up against it; without me, it’s nothing. This horribly titled MCA show closes later this week, so if you feel inspired to go see it after reading this post, you need to do so ASAP. The show is presented in two parts divided between to the two whale-ribcage- sized rooms on the entry level floor. In the first room are works by Calder, and in the second is a presentation of seven contemporary artists inspired by Calder. The lineup: Martin Boyce, Nathan Carter, Abraham Cruzvillegas, Aaron Curry, Kristi Lippire, Jason Meadows, and Jason Middlebrook. This show is really two shows. If you want to make close comparisons (or if you have short-term memory loss problems like I have), you’ll have to run back and forth from room to room. Some of the inspirations or cues derived from Calder are blatantly obvious, others more nuanced, others waaaay out there. Calder in a hot topic right now in Chicago. Flamingo, 1973 is his best known public piece in Chicago. Recently Calder’s commissioned work The Universe at Willis (aka Sears) Tower has been in the news. The kinetic sculpture may possible be removed from Willis Towers, as Sears (the original owners) want to get their hot little hands on it. For you L.A. readers, there is a great Calder public work (also a kinetic sculpture) in Los Angeles; hidden in a corner of the LACMA campus is a huge Calder fountain called Hello Girls. For most of the year the fountain is dry, but during the hot seasons jets of water propel the huge mobile about languidly. 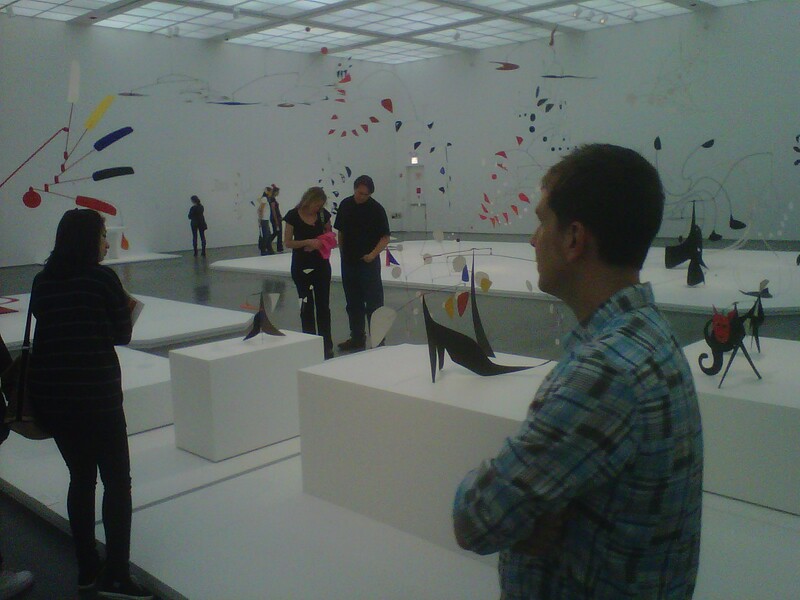 Back to Chicago, the first room (the Calder Room) looks like a giant moving Miro painting. A kelp forest of whimsical mobiles is hung from the high ceiling on delicate wires, and activated by the sublet air currents in the gallery. The artificial, diffused lighting is very white- cube-contemporary, and only a few glass vitrines disrupt the unity of the clinical space. Large (white of course) platforms, which I’m going to call risers, float like islands on the cement floor of the room. The works cast ever-shifting shadows on the risers and on the walls, but unfortunately the diffused gallery lighting diminishes most of this magical effect. The show is roughly organized into themes, but with no regard for chronology, which is unimportant really in this show. 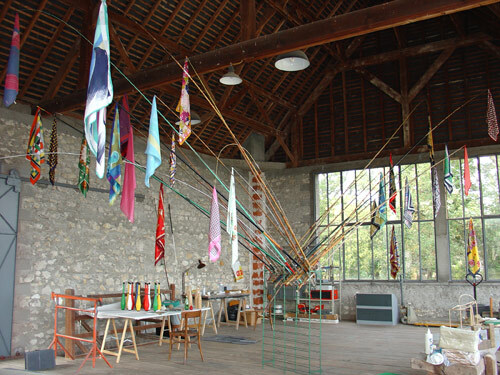 One section focuses on Calder’s creative reuse. 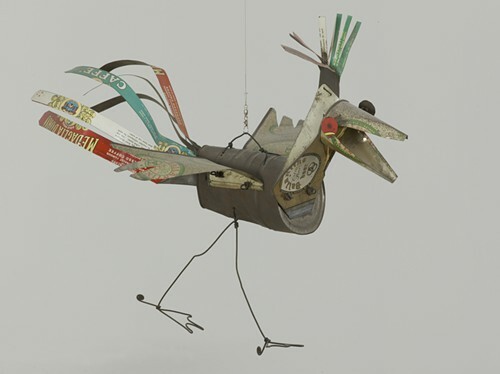 Bird , (from the MCA’s collection) made from recycled cans illustrates Calder’s choice to leave his raw materials visible. 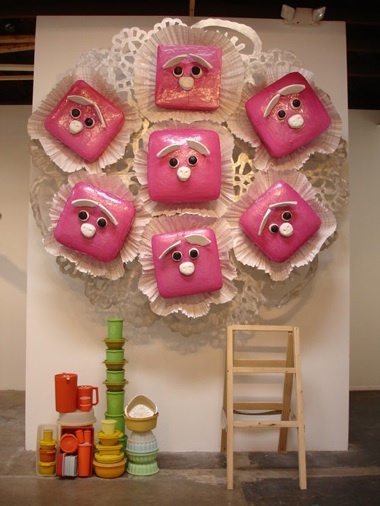 Another corner is somewhat sectioned off for a group of playful works with animal imagery. A substantial amount of the artwork in this show comes from the MCA’s permanent collection, most donated to the museum by the Horwich Family. 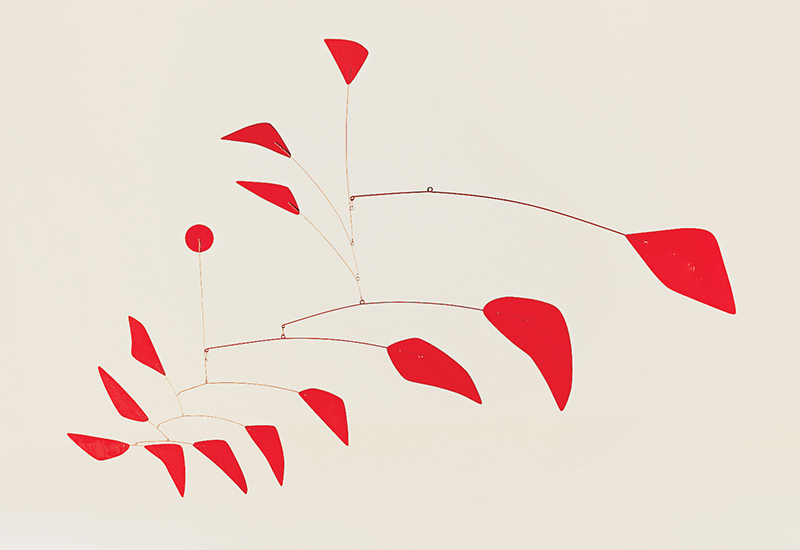 Calder was not from Chicago; Calder’s ties to the city were initially made through the Arts Club of Chicago. The Horwich’s and other Chicago collectors became introduced to Calder’s work by the private Arts Club, an interesting example of how a private members only club can directly affect (albeit many years down the road) a public art museum. This show also has a large amount of works on loan from museums across the country. 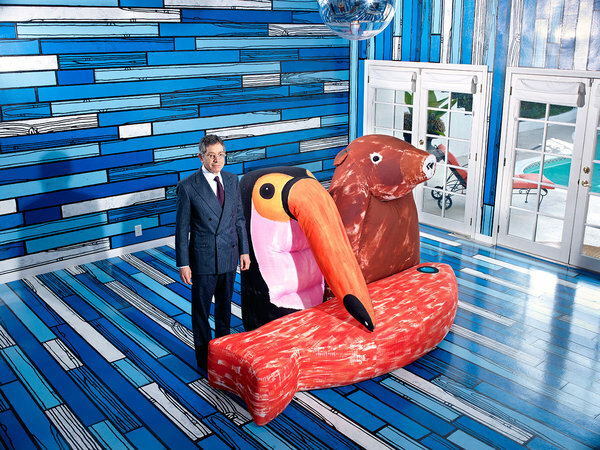 The loaners included: The Whitney, the Sheldon Museum of Art, Harvard Art Museum, and the Museum of Fine Art Houston. 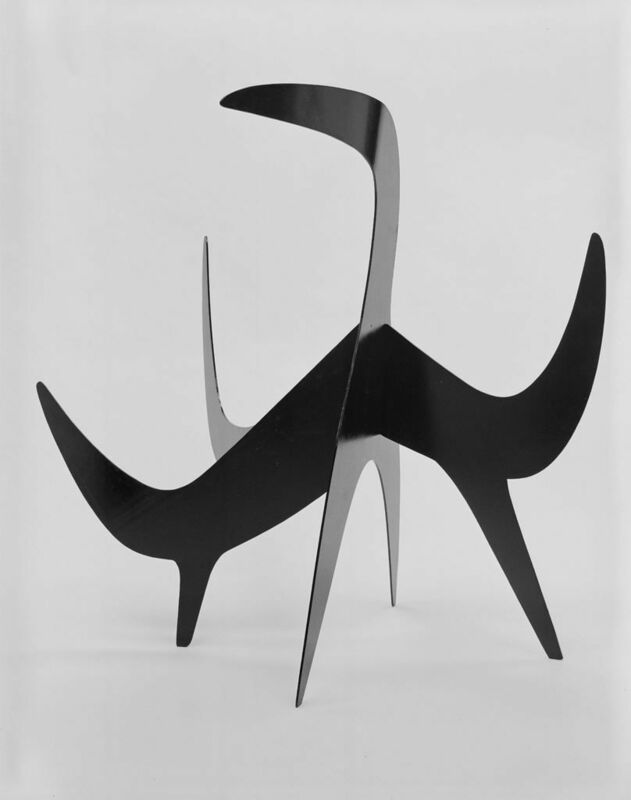 The Stainless Stealer (1966), from the Hirshhorn Museum (a notable work because Calder left it unpainted) hangs in a corner, and is surrounded on the floor by a raised border about four inches thick. The barrier seems foolish and is so unthreatening it dares you to walk over it. It’s odd the organizers of the show didn’t just put a riser underneath the work, people wouldn’t have stepped on that, or maybe they ran out of money. Another work from the Hirshhorn, Little Longnose(1959), is the only work not displayed on a riser and its spindly black legs made direct contact with the cement floor. Along another wall is a combination of things I really disliked. First, laminated cards were offered on unfriendly hooks, for visitors to ID the works hanging before them. In addition to the lamented sheets wall labels were also provided. But since a visitor passed between the wall with the labels and the works across the way the labels were intended to identify, all comprehension was really lost. Big curatorial flaw in my opinion. I don’t know why they curators didn’t just put the labels directly on the risers underneath the works, as has been done elsewhere in the room. Despite this mess I was able to glean some fun facts. I was able to figure out that a monumental work was called Big Red, (1959) and that it had come from the Whitney. Also, the Broad Foundation really does lend broadworks out all over the country. They had been kind enough to ship out Laocoon, 1947 and The Brass Gong, 1948. The Broad Foundation also helped out financially with the show as well as Ruth Horwich (of the above Horwich Family no doubt). The exhibition continued in the next room. Works by the seven artists were varied, some of the Calder comparisons are mind-numbingly obvious like Aaron Curry’s biomorphic sculptures, and some of them seem very farfetched like Kristi Lippire’s Three Under Parr, 2008, while others felt just right like Nathan Carter’s large three dimensional wire drawing, TRAVELING LANGUAGE MACHINE WITH #3 FREQUENCY DISRUPTOR AND DISINFORMATION NUMBERS STATION, 2007. Finally the exhibition continues even outside to the MCA’s sculpture garden, where some large loan pieces are displayed. And yes I touched them; they’re public art after all. I know I’m not giving the contemporary portion of the show enough attention, but that’s because I don’t care for the framing device of Calder-as-inspiration. Rather go and view these works as individual pieces, some of them are fantastic, and some far more interesting than Calder (which isn’t that hard to accomplish really). Abraham Cruzvillegas's Bougie du Isthmus, not just a great title.